So, real life is keeping me from spending much time on menu planning, grocery shopping and cooking, so today you get a real life recipe. This is what I’ve been eating this week. It’s one of those super easy dishes that you come up with when you’re staring at your fridge trying to figure out what you can throw together in about 10 minutes. For me, this usually involves eggs. I prefer to eat eggs for lunch or dinner, since even scrambling eggs feels like too much work in the morning and I usually prefer something sweet early in the day. And the best eggs involve a runny yolk! Yum! However, if you’re not into that kind of deliciousness, just give the eggs a little longer in the skillet to your desired done-ness. Also, I simply can’t have eggs without dill, it’s a wonderful combination. I also use the word sandwich here loosely…open-faced sandwiches are best in my mind, so if I’m eating at home, it’s going to be an open-faced sandwich, the proportions are just better when you can pile on the toppings without weighing it down with too much bread per bite. Crack both eggs into a small non-stick skillet that has been sprayed lightly with cooking spray, and season with salt, pepper and dill. Cook over medium-high heat for about 1 1/2 minutes, or until the egg has turned white and it starts to bubble. While it’s cooking, toast your bread. Once the egg appears cooked, carefully flip the eggs. If you like a runny yolk, I recommend turning off the heat now and just letting it sit on the hot burner while you prepare the rest of your sandwich. If you want it done a little more, let it cook for 30-60 seconds and then remove from heat. When your toast is done, spread your goat cheese over both slices (if you’re using a harder cheese, I’d recommend melting it in the toaster while you’re toasting your bread (assuming you have a toaster oven)). 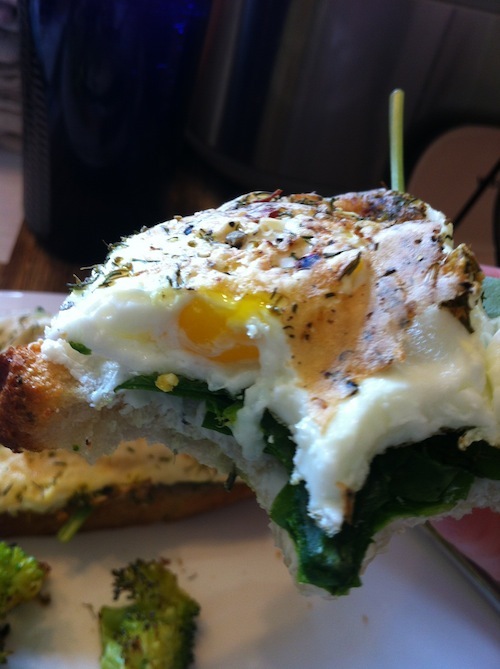 Pile on some spinach, and then top with the fried eggs.